The visitor who will wonder around the city of Corfu, the suburbs, the peripheral settlements and the wider area of the Municipality of Corfu, will have the chance to discover the ‘dowry’ that nature and man gave to Corfu. The ‘Old City’ reminds of past ages; the European influences are visible everywhere and harmoniously coexist, giving to the city a special color. There are no mosques and minarets in Corfu. No stamp of Asiatic occupation can be found on the island. Here, where Europe meets Greece and the nature ungrudgingly spread hundreds the shades of green and blue, the Corfiot Civilization developed with significant particularities which make this culture stand apart. It is very common, during high summer, the narrow streets of the city, named kantounia, to be crowded, but for the visitor there is always a quiet place in the narrow alleys or under the shaded squares to enjoy a chilled ginger beer (tsitsimpyra). The Corfiot housewives put their laundry over the streets and underneath, lost in the labyrinth of the alleys, the visitor discovers silversmiths and woodcarvers workshops. Certain parts of the city and of the wider region of the Municipality of Corfu are modern, however, traces of the Venetian, French and English occupation are everywhere in order to remind that the Turks could not occupy Corfu. Palaces, fortresses, museums, libraries, galleries, churches, interesting public buildings and privet mansions, public, privet and archaeological sites, areas of particular natural beauty and of special interest, traditional houses, verdurous olive groves, picturesque ports and blue beaches make an unexpected puzzle on the area of the Municipality of Corfu, that lives speechless even the most demanding visitor. After the tour the visitor can taste the local cuisine in one of the many picturesque little-taverns of the city; s/he can buy a characteristic souvenir of the island, the shops stay open until late at night during the summer months. The tour may end with a visit at the famous bars and discotheques of Corfu, for an all-night carousal. 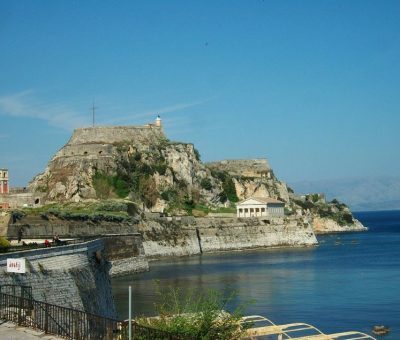 Click below for more information about the gollowing sights in Corfu.